The CHEMTROL 250 is a microprocessor-based digital controller designed to maintain both sanitizer ORP (oxidation-reduction potential or Redox) and water pH in high-end residential pools, small commercial pools and spas and light industrial applications. The CHEMTROL 250 controller is based on 20+ years of experience in pool and spa automation with over 25,000 installations worldwide. Featuring a 5-year electronics warranty, it actually pays for itself in 1 to 2 years through cost savings in operating and maintenance expenses. Installation of the CHEMTROL 250 is as easy as 1-2-3. SENSORS - Install the ORP and pH sensors on the recirculation line or on the optional bypass line. The two sensors can be mounted directly on the main recirculation line with 2" PVC tees, as shown on the schematic. For recirculation lines over 2" in diameter lines, the sensors should be mounted on a 1/2" bypass line. 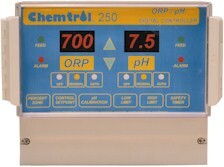 The CHEMTROL 250 ORP/pH Digital Controller automatically maintains both sanitizer ORP (oxidation-reduction potential or Redox) and water pH in pools and spas. To select a function, simply press ORP or pH and then the desired function. The display shows the current function value. Use the UP or DOWN arrows to adjust to the desired value. The standard factory-set ORP control level is 700 mV, based on WORLD HEALTH ORGANIZATION (WHO) and NATIONAL SPA AND POOL INSTITUTE (NSPI) values for prevention of germs and bacteria. To change the control levels, the operator presses ORP or pH and then SETPOINT. Use the UP or DOWN arrows to adjust the ORP and pH setpoints. To save the new setpoint value and exit, press SETPOINT again. The controller then automatically activates the chemical feeders for sanitizer and acid (or soda) feed, as required to maintain the set ORP and pH levels - regardless of fluctuations in bather load, contamination and weather. Like a thermostat maintaining a constant temperature, it prevents overfeeding or underfeeding, both of which are detrimental to good water quality. The display stops flashing when the condition is corrected. To reset the overfeed timers, turn the feed mode to off and then back to Manual or Auto. The ideal values are set as default values. They can be adjusted by the operator at any time. To reset all factory default values, press ORP and pH for 5 seconds.